A dazzler on its own this ring stands tall with 1.45 Carat t.w. in brilliant round cut Diamonds. 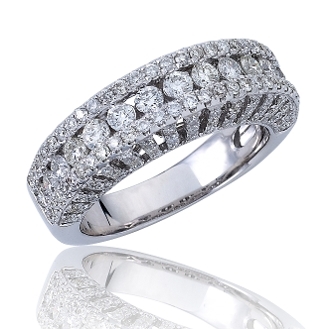 Through the center 15 exquisite Diamonds are channel set between two rows of flowing pave prong set Diamonds. This one-of-a-kind band is outrageous, on each side of the shank stand rows of vertical split tiara style rows of more pave set Diamonds, 5.1mm tall. All set in sleek, solid 14 Karat white gold. There is a beautiful filigree basket design lining the inside of the smooth, highly polished band. For added appeal personalize your item, select our Engrave option and indicate size needed when adding to Cart.